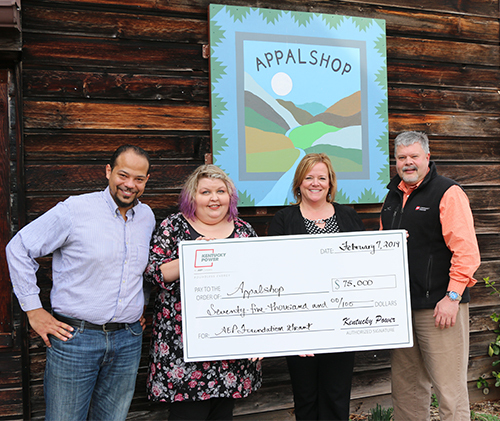 Kentucky Power awarded a $75,000 AEP Foundation grant to Appalshop in Letcher County. WHITESBURG, Ky. – Kentucky Power on Thursday awarded a $75,000 American Electric Power (AEP) Foundation grant to Appalshop, a nonprofit organization in Letcher County. Founded in 1969, Appalshop uses art and culture to tell the stories of the people of Appalachia and their rural communities through film, video, radio, new media, music, theater and community exchanges. The grant will fund Appalshop’s Appalachian Media Institute in 3-Dimensions for young people ages 14 to 22. The grant will allow Appalshop to hire a full-time teacher, buy state-of-the-art equipment and software, and offer an intensive 3-D printing pilot course and exhibition. Through Appalshop’s Appalachian Media Institute, youth filmmakers are paid to study and produce media after school and during the summer, Gibson said. They use their skills to start important community conversations on topics such as career transition, rural-urban outmigration, domestic violence, alcoholism and drug abuse, and the changing Appalachian culture. The program has boosted area graduation rates, fostered civic pride and individual confidence, and helped youth break down barriers to educational attainment common to economically struggling rural and urban communities,” Gibson said.